Early Earth evolution. What is the composition of the Earth? We are in the midst of a geochemical revolution. For decades the geochemical community has assumed that chondritic meteorites are the building blocks of the Earth. However, in 2005, a landmark discovery (Boyet and Carlson, Science 2005) at the Department of Terrestrial Magnetism (Carnegie Institution of Washington) fundamentally changed the geochemical landscape, and showed that chondritic meterorites and modern terrestrial mantle-derived rocks have small, but measurably different ratios of 142Nd/144Nd. This observation has inspired a new geochemical revolution on par with the advances made in 143Nd/144Nd systematics that started over 30 years ago, and it has forced the community to question long-held assumptions. The silicate portion of the Earth may not have chondritic relative proportions of the refractory, lithophile elements, and the 143Nd/144Nd isotopic composition of the primitive Earth may be closer to MORB than to chondrites. If the bulk Earth is not chondritic, then what is its composition? In Cenozoic-era lavas from Baffin Island—previously found to host the highest, most primitive mantle 3He/4He—we identified lavas that have primitive Pb-isotopic compositions consistent with an ancient mantle formation age of ~4.5 Ga. These lavas possess 143Nd/144Nd ratios that are also consistent with an early-formed terrestrial mantle reservoir, as suggested by the recent discovery that the Earth and chondrites have measurably different 142Nd/144Nd ratios. Together, He, Pb and Nd-isotopic compositions in these lavas suggest that their mantle source may be the oldest accessible reservoir in the mantle (Jackson et al., Nature 2010). In a follow-up paper (Jackson and Carlson, Nature 2010), we find that other large igneous provinces (LIPs)—similar to the Baffin Island basalts—may be melts of this early-Earth component tapped at different times. This result provides a self-consistent way forward for developing models of the isotopic evolution of the Earth that are consistent with multiple isotopic systems, including the noble gases. If chondrites do not provide an analogue for estimating the refractory, lithophile element abundances in the Earth, then the composition of the high 3He/4He reservoir may provide a way to constrain the composition of the silicate Earth. Jackson and Jellinek (G-cubed 2013) construct a non-chondritic composition for the silicate Earth that is consistent with the geochemistry of the mantle source of terrestrial mantle-derived lavas with the highest 3He/4He. If this composition reflects the composition of the silicate Earth, there are enormous implications for the thermal evolution of the planet, the style of early plate tectonics, and whether or not “missing” geochemical reservoirs are required in the deep Earth. What is the fate of subducted lithosphere and sediments? Recycling into mantle plumes? My research group examines the compositions of oceanic lavas and ultramafic xenoliths to quantify the chemical and isotopic variability in the mantle to better understand its dynamics and evolution. How well does the injection of subducted materials into the mantle explain observable mantle heterogeneity, and what role do exotic (metasomatic) processes play? Following billions of years of convection, at what length scales is the mantle heterogeneous, and how are these heterogeneities distributed? How are mantle heterogeneities sampled by lavas at hotspots, and how did processes operating in ancient subduction zones generate the heterogeneities that we observed in the mantle? To answer these questions, we prospect for signatures of ancient, subducted crustal materials that have been recycled into the mantle sources of hotspot lavas. In Jackson et al. (Nature 2007), we report geochemical data on a suite of enriched Samoan lavas hosting an unambiguous recycled sediment signature (87Sr/86Sr up to 0.722!). These unprecedented results show that there must be regions of the mantle where crustal heterogeneities survive, in spite of the prevailing notion that the convective motions of the mantle greatly attenuate the geochemical signatures of subducted materials. Supporting this contention, we have identified MIF (mass independent isotope fractionation) sulfur-isotope anomalies in oceanic lavas from the South Pacific (Cabral et al., Nature 2013). Terrestrial MIF sulfur isotope signatures were generated exclusively through atmospheric photochemical reactions until ~2.5 billion years ago. Therefore, the discovery of MIF sulfur in these young oceanic lavas suggests that sulfur—likely from ancient oceanic crust—was subducted into the mantle before 2.5 Ga and recycled into the mantle source of hotspot lavas. This discovery provides the first unequivocal evidence that material once at the Earth’s surface was processed in subducted zones at least 2.5 billion years ago, and is sampled in relatively young (<20 million-year-old) hotspot lavas. Melt inclusions: What can little bits of melt (the width of a human hair) tell us about the deep Earth? Depleted and recycled crustal reservoirs in the Earth’s mantle mix and generate heterogeneities over a range of lengthscales. We use the chemical and isotopic measurements of olivine-hosted melt inclusions to constrain the compositional heterogeneity in the mantle sources of volcanoes that is not seen using traditional “whole rock” methods. In order to precisely measure the compositions of small quantities of material with a high degree of spatial resolution, we use in situ methods employing laser ablation ICP-MS. Jackson and Hart (EPSL 2006) employed laser ablation techniques to make the first ever 87Sr/86Sr measurements on melt inclusions. We reported significant 87Sr/86Sr variation in melt inclusions from a single lava that spans 50% of the variability in the oceanic mantle. We are adding Pb-isotopic measurements to our toolkit, and pairing Sr and Pb isotopic measurements in melt inclusions has the potential to constrain the relationships between magmatic processes and mantle heterogeneity. Melt inclusion can trap melts at great depths before significant degassing has occurred, and inclusion present an opportunity to constrain the volatile budgets of mantle-derived lavas. Currently, we are measuring volatile abundances from a wide variety of sample localities, including melt inclusions hosted in hotspot lavas representing the HIMU mantle endmember (thought to represent recycled Archean crust) and melt inclusions from the Ontong-Java Plateau (the largest of the large igneous provinces preserved in the geologic record). Are volcanic hotspots fed by deep-seated mantle plumes? 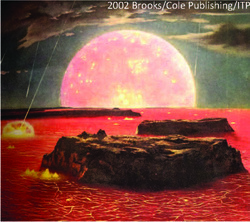 Hotspot volcanism, like that famously illustrated in the Hawaiian islands, is thought to be caused by buoyantly upwelling plumes that rise from the deep mantle and melt beneath the oceanic lithosphere. Many oceanic hotspots in the Pacific are characterized by age-progressive chains of volcanoes, which result from the oceanic plate moving over a relatively stationary mantle plume. However, hotspot volcanism in the Cook-Austral islands in the southeast Pacific does not show a clear age progression, and the lack of an age-progression at this hotspot has been used consistently to argue against the long-standing model that upwelling mantle plumes partially melt to generate hotspot volcanism. An alternative model for volcanism in the Cook-Australs argues that the lack of a clear age progression is the result of not one, but three different mantle plumes that are spaced roughly 1000 km apart along the volcanic chain of islands and seamounts. The Samoan hotspot, located 1000 km to the WNW of the Cook-Australs, is also located on the same volcanic corridor, and constitutes the fourth hotspot along a “hotspot highway”, so named because of the unusual number of hotspots that may exist along a single volcanic corridor. Supporting the hypothesis of four separate hotspots along the hotspot highway, the islands and seamounts of Samoa and the Cook-Australs exhibit four age progressive volcanic trends: The Tubuai trend, the Atiu trend, the Rarotonga trend and the Samoan trend. The plume model for the generation of hotspots argues that the eastern portion of hotspots on the Pacific plate should be anchored by an active (or exceptionally young) volcano. Indeed, the Tubuai trend is anchored in the east by the volcanically-active Macdonald seamount, the eastern portion of the Atiu trend is anchored by the exceptionally young (230,000 years old) Arago seamount, and the Samoan chain, is anchored on its eastern terminus by a volcanically active seamount, Vailulu’u. If the hotspot highway is supplied by four concurrently active, long-lived mantle plumes, then the volcanism generated along the hotspot highway would have been “rafted” to the western Pacific in the direction of plate motion: the older portion of the hotspot highway should exist as seamount, guyots and atolls distributed along volcanic lineaments in the western Pacific. We had an NSF-funded cruise in the Tuvalu islands in 2013 to test the hypothesis that these remote islands constitute the older, western portion of the Atiu trend. Future research will focus on identifying the older portions of the Tubuai and Rarotonga volcanic trends, to determine whether these hotspots are truly long-lived and have volcanic edifices in the western Pacific. Subduction zones and back-arc basins. We are also working on back-arc basin lavas from the northern Lau and North Fiji Basins to “map out” the extent of the incursion of the Samoan plume into the region. Lavas erupted at hotspot volcanoes have unique chemical signatures which suggests that lavas derived from plumes can be distinguished from lavas derived from the shallow upper mantle. The Samoan hotspot is located ~100 km north of the northern terminus of the Tonga trench, where the Pacific plate subducts into the mantle. The juxtaposition of the Samoan plume with the northern terminus of the Tonga subduction zone offers a unique opportunity to explore how mantle flows around the edge of a subducting plate. In particular, the unique chemical signatures associated with the Samoan plume can be used as tracers to “map out” mantle flow around the subducting Tonga slab. In this project, we characterized the distribution the Samoan plume beneath the Lau Basin, which overlies the subducting Pacific plate. While a Samoan plume chemical signature has previously been identified at some volcanoes in the northern Lau Basin, the westward extent of the Samoan plume’s incursion into the region has not been explored. We identify evidence for a geochemically-enriched mantle component that we interpret to be associated with the Samoan plume in both seamount and back-arc basin lavas in the region of the northern North Fiji Basin, more than 1000 km to the west of the Samoan hotspot and the Tonga trench. We argue that the Samoan plume entered the region 4 million years ago, when the northern terminus of the Tonga trench was located more than 1000 km west of its current location (Price et al., G-cubed 2014). The new data are consistent with the broad distribution of a Samoan plume component throughout the mantle beneath the Lau Basin and the northern North Fiji Basin. Linking the entire deep geochemical cycle, from subduction zones to hotspots, is critical to understanding the evolution of the crust-mantle system through geologic time. One of our current NSF proposals (“The role of oxygen fugacity in calc-alkaline differentiation and the creation of continental crust at the Aleutian arc.””) highlights a long-term goal of understanding processes at convergent margins to develop a more complete view of mantle dynamics and evolution, from subduction zones to hotspots.